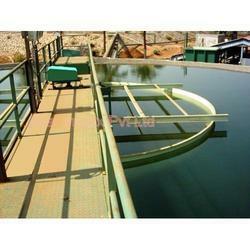 Our product range includes a wide range of clarifier. Our Clarifier also called as Mechanical Scraper Systems is designed for low cost and efficient removal of solid particles from processed water. Water clarifier reduces the velocity of the water, ensuring that the incoming water is distributed uniformly in all the directions to fully utilize tank capacity. This also provides maximum setting time causing efficient separation of settled particles from water. Collected particles gradually travel down the through the slope forming sludge. The clear water in the overflows out via. launder.